During the last day of Prince Harry and Meghan Markle's Royal Down Under Tour, the couple spent some time in Rotorua, New Zealand, learning about the Maori culture and attending a powhiri in their honor. A powhiri is a traditional Maori welcome ceremony with dancing, singing, and a Hongi or traditional Maori greeting. Rotorua is a city on Lake Rotorua known for its Maori culture. 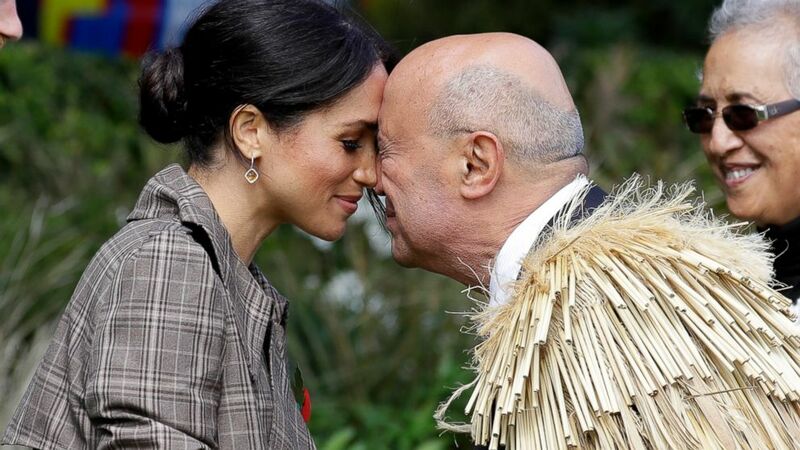 Meghan wore a Stella McCartney dress, but then added a traditional Maori dress Corona, or a coat, on top of the dress when she visited the Powhiri. Harry received a carved weapon and an ax as he visited the Tamatekapua Meeting House where the event took place. Trevor Maxwell, a county council member, joked that he should not bring the ceremonial weapon for the upcoming match between New Zealand and England's rugby teams on November 11th. During his speech, Harry said it was an "honor" to "spend time with the people of Te Arawa and Ngati Whakaue on the lake shore." "One of the joys of our visit to New Zealand was the opportunity to meet so many young New Zealanders who use their talents and energy to make a difference," said Harry. "There are creative, talented and caring Te Arawa Rangatahi youths who use their talents to preserve and promote the Maori language, promote mental wellbeing, and work in areas that benefit their communities Country, "he added. The royal couple then head to Rainbow Springs Park, also in Rotorua, to learn more about the center's kiwi breeding program. Kiwis are the national bird of the South Pacific island state, but it is increasingly endangered. Harry and Meghan will meet with those who are committed to protecting the special species. They also get the opportunity to name two kiwi chicks. From there, the couple meets with members of the public in the city and then visits the Redwoods Treewalk Rotorua, where they will see some over 100-year-old redwood trees. Tomorrow, the royal couple will finally return to London to complete their 16-day tour with four nations in Down Under.